We are entering a season of divine unrest in the world, a season when people will be looking for light as they fall prey to the darkness that is all around them. The Lord is allowing this earth to shake like it’s never been shaken before. The kingdoms of this world have been dominated and controlled by principalities of wickedness that have opposed and sought to destroy the very memory of the Prince of Peace, Jesus Christ; they will not prevail against Him. He has already won this great battle and sealed the fate of those who are His enemies. The Father is bringing a fire to this earth that will not transform the world, but it will bring those who belong to Him, out of it. We are being sifted to the very core of who we are and truly being asked of God “Who do you say that I am?” “Do you know me?” The Lord is searching the hearts of all men, calling all men to repentance. It’s through the shaking of what can be shaken that His unshakable Kingdom is made manifest. The Word of God clearly says that darkness will cover the earth and gross darkness the people, but something awesome is to happen for the people of God. We are presently entering into this time when Satan’s anger is kindled upon the earth; he knows his time is short. It’s easily seen as we look around the world and observe the governing of principalities of wickedness being brought out into clear view within governments, cities and Nations. The world is in a an uproar as darkness, demons and all forms of evil take more ground and claim more souls every second. We are also seeing unholy agenda’s, spoken of in dark places being exposed, which had previously been hidden. The kingdoms of this world are beginning to reveal their true instabilities and it’s bringing great fear to the hearts of men/women. The world is changing at a rapid rate; almost daily, there are new record climate changes reported, governments are in upheaval and the people are falling prey to greater and greater deeds of wickedness. The Father’s shaking the earth in such a manner that His Glory will cause everything hidden to come to light. It’s not going to be a pretty sight, nor an easy season for those who’s hearts are cold. We as a people, a Holy people, are being called upon by the Lord to be warriors in this end age, not warriors of pride, who wear the garments of man-made religion and traditions and who carry weapons that hold no power against the enemy; but we are being called by the Father to put on the Lord Jesus Christ, the Captain of the host Himself. There are many in this crucial hour that will be desperately in need of a safe haven. We who have separated our lives for His purposes alone, will be visited by the abiding Glory of the Lord; the very essence of our God that will give men, women and children a light that will guide them out of the darkness covering the earth and into the safe haven of the Arc (Jesus Christ). The Word of God states in the book of Isaiah, that in that dark hour, His Glory will be seen over us and men would be drawn to this light. WHY? because it will be the only light left in this world; You and I, as we lay it all down for Him and pick up our cross will become the temple of His Spirit He destined His Church to be. We are being beckoned by Jesus to lay down the love for this world and march upon His command; carrying nothing but His battle plan with us. Far too long the church in general has looked for formulas, programs, and cheap impostors to bring them victory and wealth. Jesus is the only means by which we will conquer our enemies; His Word, His Spirit, His leading, His blood and His testimony upon our lips. Through Him we will do valiantly, for it is He, who shall tread down our enemies. There is no cheap imitation of Sonship in Christ. It’s time to pray Church; pray as the Apostles and early Church prayed; every day and with passion. Pray like it’s what’s holding your world together, because in a sense, it is. We are called to pray over our leaders, families, souls, cities, governments and over every area of our own lives, as well as the lives of those who are our brethren in the world. They are to be covered in prayer by us, the Church; as we spend time before our God pouring incense out before Him on His altar. He said ” My house shall be called a house of prayer for the Nations” We need to let heaven hear our sincere cries for mercy upon this world and the backslidden; so that His Kingdom can be established in the hearts of people around the globe. We should also be earnestly praying for laborers to be raised up and sent out into these plentiful harvest fields. We could see a bumper crop of souls come into the Kingdom, if we would allow the Holy Spirit to lead this battle and if we have ears to hear His guidance. Is anyone sick among you, is anyone suffering? the Word says, let him PRAY. 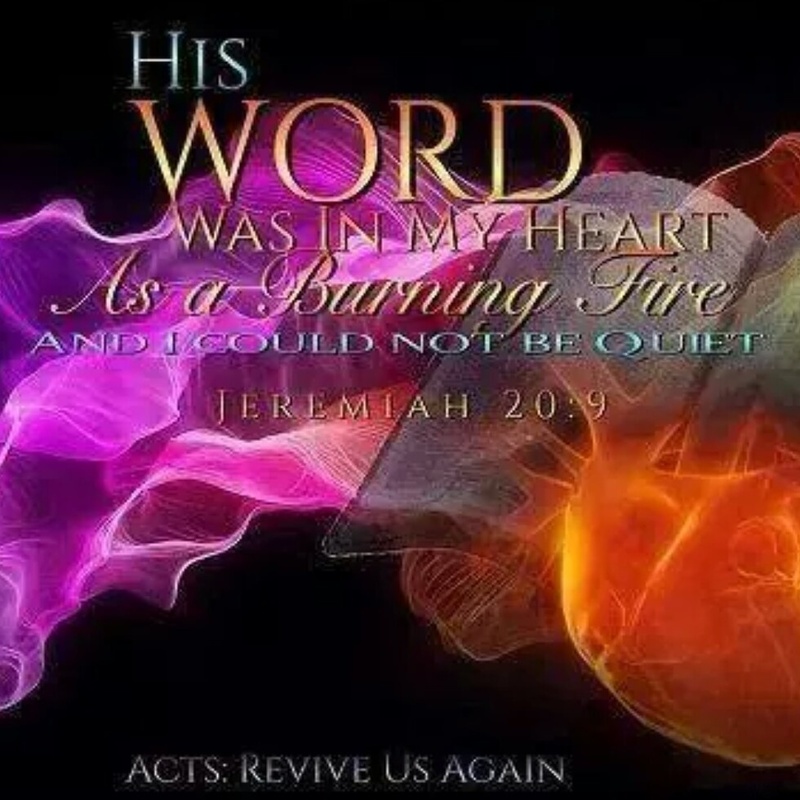 Let us arm ourselves with His Word in our hearts and wear our voices out crying out to God the Father so that He may use us, to be Glory carriers in this last day. People need the Glory and Presence of God within them, not just to pacify a worshippers desire to know Him, but so that others CAN SEE THEIR WAY OUT OF DARKNESS. Yes, we enjoy His Presence and Glory. I’m a Godaholic in the worst way but I’ve grown up in Him to realize, that He fills me, so that I can be equipped to help someone else, not just to satisfy my own desires. We are carriers of an infectiously, wonderful cure to a horrible disease being spread around the world by the enemies of God. We can choose to be healers of those who are bound by Satan or we can choose to stay in our comfort zones and rely on others to do it all. I know when Jesus returns, he’s going to be looking in the fields for His laborers, not in the pews. Whatever it is God has called you to do, you can only be effective doing it when He becomes all that you care about. If your filled with your own promotion, your own well-being, your call is going to reflect a vessel of beauty outwardly but an empty shell inwardly. We need His Presence to dwell within these earthly tents. The Father draws near to the areas of our life that we have allowed to be crucified for His Glory; He fills us more and more as we allow death to come to the fleshly nature. It’s not fun laying your will down and choosing to walk in the will of another, but the reward is eternal fruit, being born for the King of Kings. It’s choosing to see your name up in heavens lights, while this world throws you out as evil. Which will it be? The road of the Glory carrier or the road of those who will one day need the light they were intended to bring to others. Oh it’s time church, it’s time to repent of being lazy, complacent and half-hearted. It’s time to sell everything so to speak and give it all up into the hands of the one who’s holding the Keys of death, hell and the grave. CHOOSE to be a Glory carrier and ready yourself for His visitation.